Friday, November 10th, at 2:00 pm – Veterans Day Celebration at Freeport City Hall. Saturday the 11th at 7:00 pm – Veterans Jam will take place on at the new stage in Hammock Bay! We know November 11th as Veterans Day, but what is the significance of the 11th of November? Veterans Day has been celebrated every year since 1938 however, it was not always known as Veterans Day and for a short time, it was actually celebrated in October. On November 11, 1918, World War I officially ended. But it wasn’t until 1938 that the government took action to honor the end of the war and make November 11th a legal holiday. Originally known as Armistice Day, the holiday was to honor World War I veterans. By 1954, the US had been through World War II, as well as the Korean War, and congress amended the Act of 1938 to change Armistice Day into Veterans Day in order to honor American veterans of all wars. In 1971, under the Uniforms Holiday Bill, Veterans Day was moved to the fourth Monday in October but due to its lack of popularity among the states, it was moved back to being observed on November 11th in 1978. Since the establishment of Veterans Day in 1954, many monuments and memorials have been built to remember all those who have served our country. One of those memorials stands proud right here in Freeport thanks to one man’s desire and a proactive committee and town. Back in 2010, the Town Planters Society received a letter written by the town historian on behalf of Trudy Boudreaux, a long time resident of Freeport. Ms. Boudreaux was hoping the club would be able to help with getting a memory garden in place to honor those who have served. Her husband, Bob was on the first ever Blue Angel flight crew and it was his desire to have a memorial in place. Since his passing, she was determined to see that it happened. Tim Ard was touched by the letter and took on the project and formed a committee which began fundraising immediately. With the wonderful support of the area, by Veterans Day 2010, over $30,000 had been raised and Freeport celebrated its first ever Veterans Day ceremony unveiling the memorial. That was just the beginning. Branch service flag poles were added in 2011 and in 2012 fundraising began for the Fallen Soldier memorial and the POW/MIA tribute. Things slowed down for a bit, but in early 2016 requests came in for personalized bricks to honor and remember veterans. That led to the design and installation of HERO WALK, a beautiful granite obelisk, surrounded by bricks with veterans information. On Veterans Day that same year, it was unveiled along with new landscaping and a new fence surrounding the memorial grounds. Bricks are still available for purchase and are ordered on a quarterly basis. If you would like more information on ordering a brick, Tim Ard can be reached through the Freeport Veteran Memorial Facebook page. The Freeport Veterans Memorial has grown immensely since the initial idea of a remembrance garden and this year is no exception. Through grant monies from the St. Joe Community Foundation, a Purple Heart Memorial has been added. The final phase of the memorial, Walk Of War, has also been added and both will be unveiled at this years event. 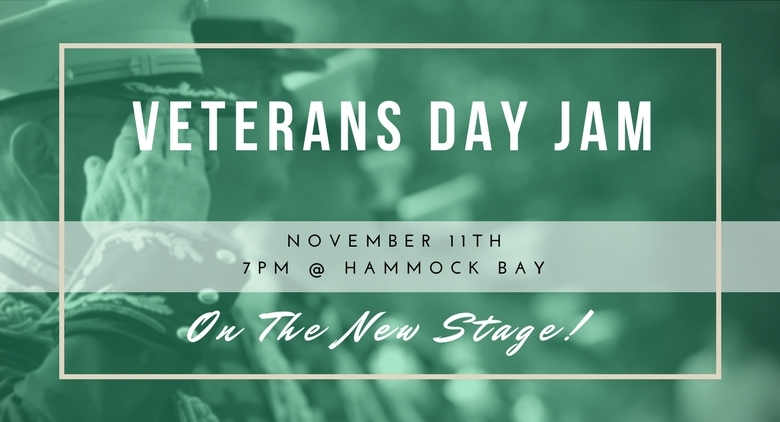 On Friday, November 10th, at 2:00 pm, there will be a Veterans Day celebration and the unveiling of the newest additions and the 2017 Veterans Jam will take place on Saturday the 11th at 7:00 pm at the new stage in Hammock Bay! The free concert is to benefit the Freeport Veterans Memorial, so donations are encouraged! With eight different artists including: Amy Blizzard, Nathan and Brittany Worthey, Artie Rodriguez, Ashton Evans, Courtney McCormick, Danny McNeil, The Sophistocats, and Freeport Jam, its guaranteed to be a great show! We encourage you to check out Walton County’s only Veterans Memorial located at the Freeport City Hall and hope to see you for the celebrations coming up in November.